Jan van der Straet, alias Giovanni Stradano (1523-1605), The Gluttons (1587), further details not known. Image by Sailko, via Wikimedia Commons. After hearing Francesca’s story in the Second Circle of Hell, Dante weeps for her and faints. When he comes to, he realises that he is now in the Third Circle, where it is pouring with rain, snow and huge hailstones, which fall down in sheets. This soaks the ground, which is stinking mud as a result. He sees Cerberus, the fearsome three-headed canine monster which guards this circle, it too soaked by the unceasing rain. 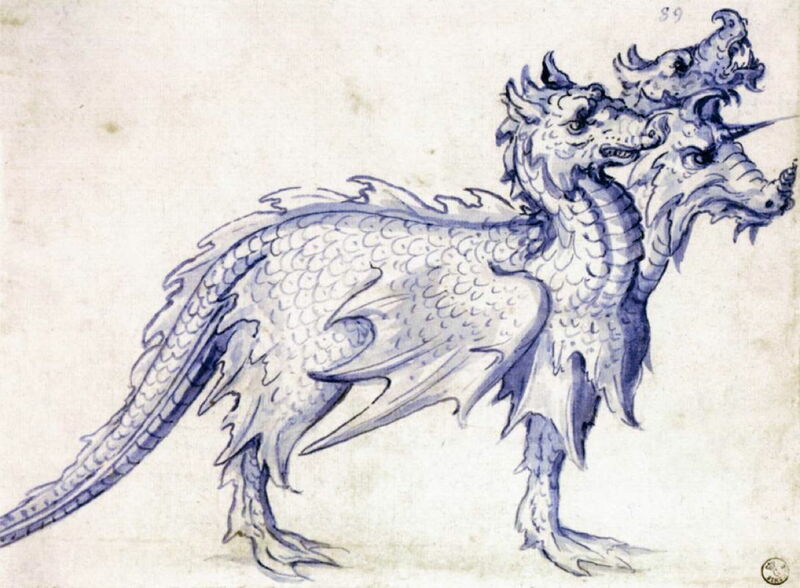 Giuseppe Arcimboldo (1527–1593), Sketch for a Cerberus (1585), brown pen and blue wash, dimensions not known, Galleria degli Uffizi, Florence, Italy. Wikimedia Commons. 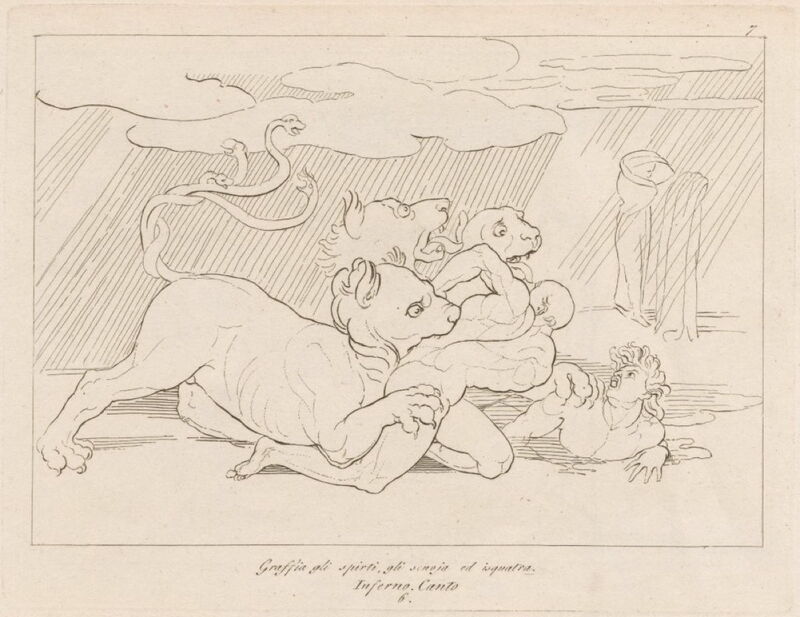 John Flaxman (1755–1826), Cerberus (Divine Comedy) (1793), engraving by Tommaso Piroli from original drawing, media and dimensions not known, Cornell University Library, Ithaca, NY. Wikimedia Commons. 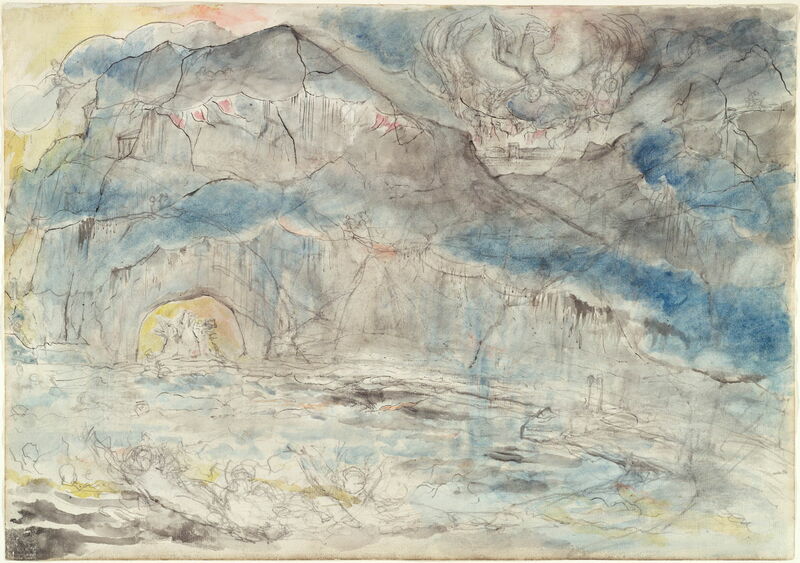 William Blake (1757–1827), Cerberus (second version) (Dante’s Inferno) (1824-27), watercolour on paper, dimensions and location not known. Wikimedia Commons. 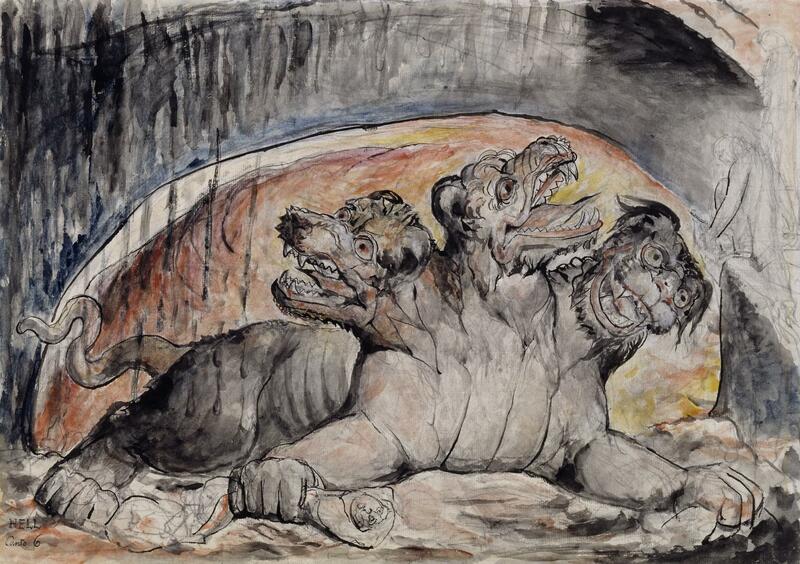 Joseph Anton Koch (1768-1839), Cerberus (1825-28), fresco, dimensions not known, Casa Massimo, Rome, Italy. Image by Sailko, via Wikimedia Commons. 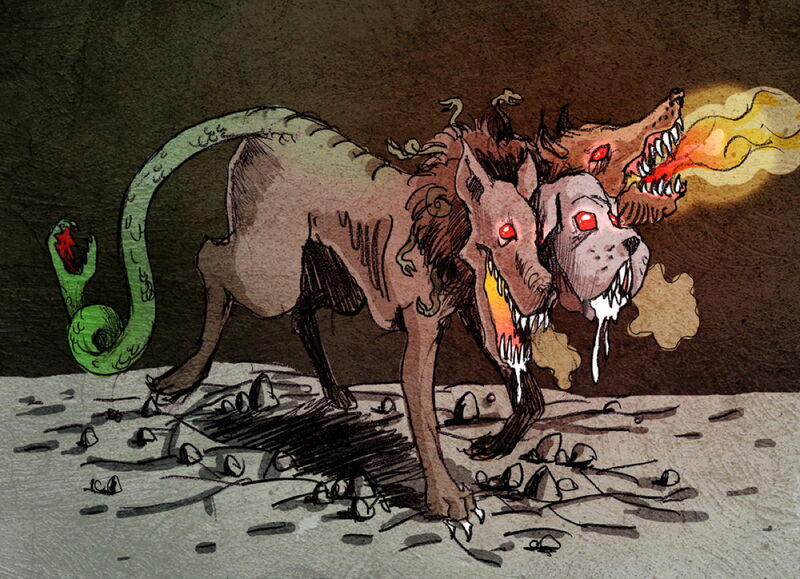 Philippe Semeria (contemporary), Illustration of Cerberus (2009), further details not known. Wikimedia Commons. 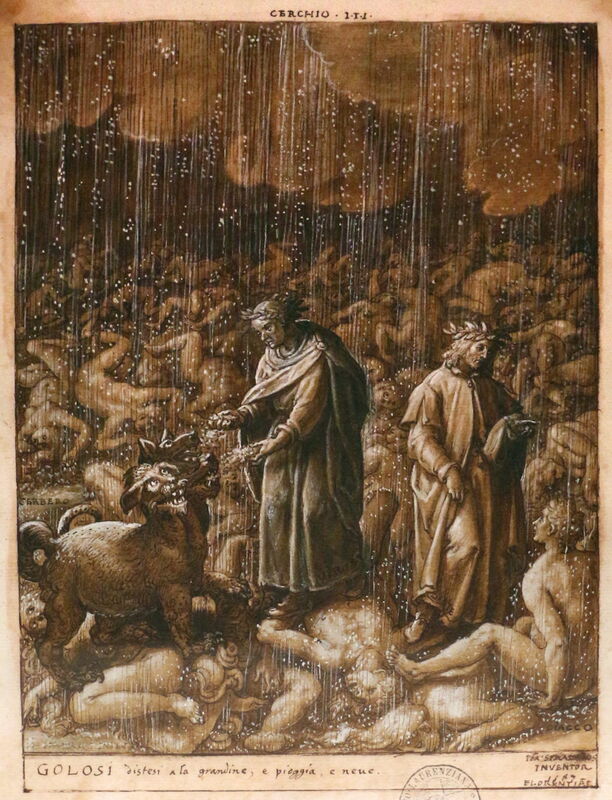 Its heads bare their fangs at Dante, but his guide Virgil scoops up three handfuls of mud and throws them into the mouths of Cerberus to assuage its hunger. 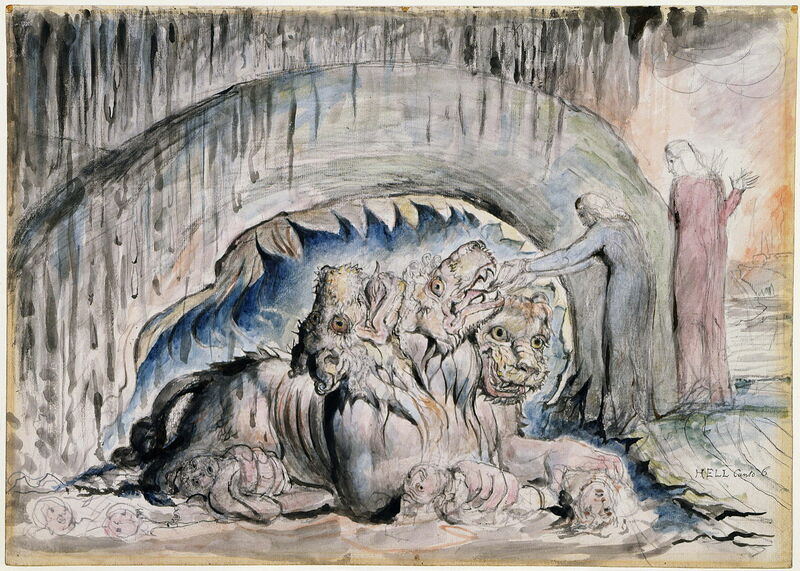 William Blake (1757–1827), The Circle of the Gluttons with Cerberus (Dante’s Inferno) (1824-27), watercolour on paper, dimensions and location not known. Wikimedia Commons. Dante and Virgil walk on the flat plain among the prostrate forms of its gluttons. One of them sits up and accosts Dante, reminding him that they knew one another. 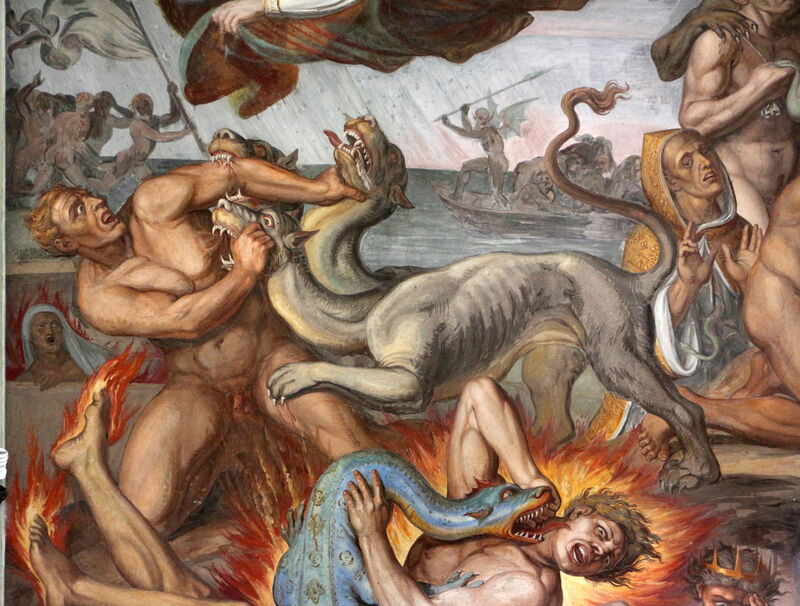 He is Ciacco (a nickname, literally ‘Hoggio’), who tells Dante of his suffering there, and the names of five other Florentines of noble rank who are in the lower circles of Hell. Gustave Doré (1832–1883), Ciacco and the Gluttons (c 1857), engraving, dimensions and location not known. Wikimedia Commons. Ciacco then falls flat on his face in the stinking mud to await the Final Judgement. 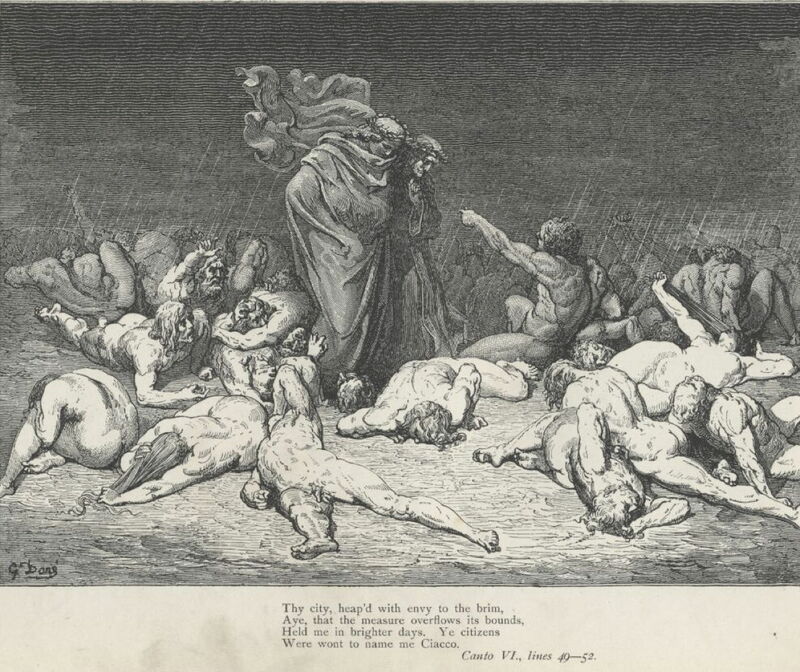 As Virgil leads Dante down to the next circle, they talk of what will happen when the Apocalypse comes, until they reach the dreaded figure of Plutus. Giuseppe Arcimboldo (1527–1593) was a highly original and individualistic Italian painter now best known for his portraits consisting of assemblies of fruit, vegetables and other objects to form human images. He also painted more conventional works which are largely forgotten today, and was court painter to the Habsburgs in Vienna and Prague. You can see some of his portraits in this article. Philippe Semeria is a young contemporary artist who is an enthusiast for comics and an aspiring illustrator. Posted in General, Life, Painting and tagged Arcimboldo, Blake, Dante, Divine Comedy, Doré, Flaxman, Koch, narrative, painting, Semeria, Stradano, van der Straet. Bookmark the permalink.